Senate committee hearings and other Capitol events are posted to this page soon after they are announced, and removed at the end of the day. You are invited to revisit this page often for the most current version. 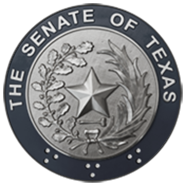 For links to individual Senate committee websites, please visit the Senate's Committee portal. For live, streaming video broadcasts of committee hearings and other events within the Capitol complex you may visit the Senate Live Video Broadcasts page. Official Senate hearings and events are archived and can be accessed from the Senate Audio/Video Archives page or from the individual committee pages. Events listed on this page will be carried live on the Senate Live Broadcasts page unless otherwise noted. Due to technical limitations, most out-of-town committee hearings and all "desk meetings" held on the Senate floor can not be carried live. For such events, audio recordings will be posted to the main Audio/Video Archives, as well as the relevant committee pages, as soon as possible. A complete Senate room reservation schedule may be be found at www.roomsched.senate.texas.gov. There are currently no press conferences or other Capitol events scheduled for broadcast. * Live broadcasts are publicly available from the Senate Live Broadcasts page. These events are also available on the internal Capitol Complex cable television system. Events marked as "NOT LIVE" cannot be carried live due to technical limitations. In most cases, these events will be audio-recorded and posted to the Senate Audio/Video Archives page as soon as possible.